Animal groups are an effective test-bed with which to investigate distributed intelligence since individuals make effective decisions across a range of contexts and in the face of incomplete or changing information. In addition, being ubiquitous, with numerous examples found in unicellular organisms, fish and mammals (including humans), the outcome of collective decisions, such as regarding direction of travel, can be relatively simple to quantify. Thus animal groups offer an excellent opportunity to measure how individuals contribute to decisions and the effect of modifying the information that is provided to members of the collective. We have revealed how information can be transmitted among, and highly effective decisions made by, group-living organisms without requiring signaling, individual recognition nor knowledge of the preferences of others. We also introduced the concept that uninformed individuals – or those who are informed but do not have strong preferences regarding the outcome of the decision (unbiased individuals) – may play an important role in decision-making. This is in sharp contrast to the conventional view that had considered uninformed individuals to be, at best, a source of noise in collective decision-making, and at worst a means by which extremist views can propagate in populations. 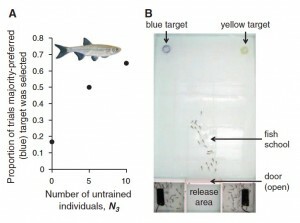 We demonstrated, using both theory, and experiments with schooling fish (shown here), that in contrast to this view, uninformed individuals prevent a strongly opinionated minority within a group from otherwise dominating the decision-making process, and return control to the numerical majority. Couzin, I.D., Ioannou, C.C., Demirel, G., Gross, T., Torney, C.J., Hartnett, A., Conradt, L., Levin, S.A. & Leonard, N.E. (2011) Uninformed individuals promote democratic consensus in animal groups. Science 334(6062) 1578-1580. In addition to testing our predictions with schooling fish we have also done so with primate groups using high resolution GPS collars on almost all adult members of a wild, free-ranging baboon troop. In Couzin et al. (2005), above, we made key predictions regarding the geometry of decision-making, notably that organisms should transition from ‘averaging’ the directional preferences of potential leaders if the differences in ‘opinion’ (the angle between preferred directions) is below a critical value, and spontaneously coming to a consensus decision, selecting the majority-preferred direction, above that angle. Furthermore in Couzin et al. (2011) we predicted that heterogeneity in preferences, and particularly the presence of a small proportion of individuals without strong directional preferences, would result, spontaneously, in a process of shared, or ‘democratic’, decision-making. 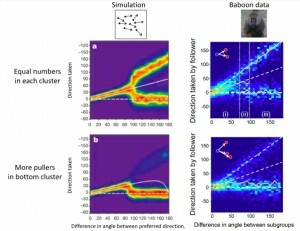 Both of these predictions were borne out in the analysis of baboon collective motion (a comparison of the predictions of the simulation in Couzin et al. 2005 and the baboon data in Strandburg-Peshkin et al. 2015, is shown below). 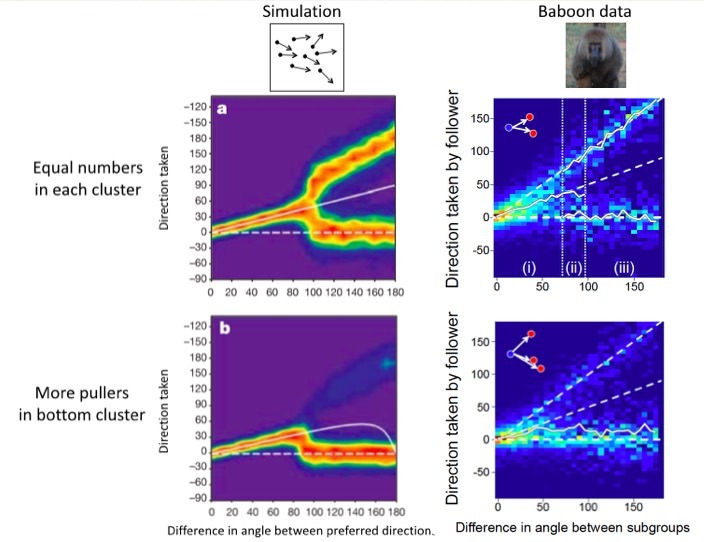 Strandburg-Peshkin, A, Farine, DR, Couzin, ID, Crofoot, MC (2015) Shared decision-making drives collective movement in wild baboons. Science 348(6241): 1358-1361. Do bigger groups make better decisions? In the conventional view of group decision-making, often termed the “wisdom of crowds”, it is assumed that large groups make better decisions. In these previous studies it has been assumed that individuals make independent estimates based on the same (single) environmental cue. However in the real world it may be rare for decisions to be made based on a single cue, and furthermore most cues will exhibit some spatial and temporal correlation (animals closer together in space are more likely to have a similar viewpoint, and experience similar odors etc.). Consequently the sensory information that near neighbors detect will also be, to some degree, correlated. We have demonstrated that taking such natural complexity into account considerably alters the relationship between group size and decision accuracy. In only a minority of environments do we observe the wisdom of crowds phenomenon. More typically we find that a finite, and often small, group size maximized decision-making accuracy. Thus the conventional view of the wisdom of crowds may not be informative in realistic, complex environments, and that being in small groups may maximize decision accuracy across many contexts. Kao, A.B. & Couzin, I.D. (2014) Decision accuracy in complex environments is often maximized by small group sizes, Proceedings of the Royal Society of London Series B 281(1784), 2013305. There are often multiple informational dimensions (color, texture, pattern etc.) in natural environments. We have demonstrated that animal groups can integrate these and achieve consensus, even though no individual is explicitly aware of, or has a unique preference for, the consensus option, and that a Bayesian decision-making framework can aid the interpretation of experimental data. A video from this experiment is shown below. Miller, N., Garnier, S. & Couzin, I.D. 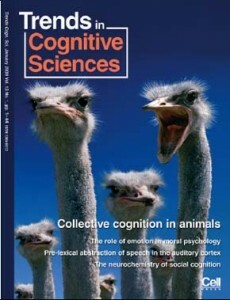 (2013) Both information and social cohesion determine collective decisions in animal groups, PNAS 110(13), 5263-5268. The field of collective behavior has been dominated by approaches in which individuals are considered as “self-propelled particles” and interactions defined as “social forces”. We are working to move away from this, towards representations that consider, explicitly, the fact that organisms are probabilistic, stochastic decision-making entities. What further properties can individuals in groups achieve if we consider collective decision-making within the context of individual cognition? How can animal groups be both robust to noise, yet sensitive to meaningful, localized information? What is the role of learning in the context of collective decisions? How do organisms make repeated decisions, and how do they encode a ‘backup plan’ in the face of dramatically unexpected outcomes? Can, and do, individuals infer the movement intentions of others? How is multi-sensory information integrated when making decisions? How do the mechanism(s) of collective decision-making inform the process by which collective behavior has evolved? What role do different types of individuals differences play (e.g. status, informational, physiological, genetic) play in collective decision-making? We are hoping to address these, and other, questions in ongoing, and future, laboratory and field experiments. If these questions are of interest to you and you would like to join the team, or collaborate, please contact me! Ioannou, C.C., Singh, M. & Couzin, I.D. (2015) Potential leaders trade off goal-oriented and socially oriented behavior in mobile animal groups, The American Naturalist 186(2), 284-293. Kao, A., Miller, N., Torney, C., Hartnett, A. & Couzin, I.D. (2014) Collective learning and optimal consensus in animal groups, PLoS Computational Biology 10(8), e1003762. Strandburg-Peshkin, A., Twomey, C.R., Bode, N.W., Kao, A.B., Katz, Y., Ioannou, C.C., Rosenthal, S.B., Torney, C.J., Wu, H., Levin, S.A. & Couzin, I.D. (2013) Visual sensory networks and effective information transfer in animal groups, Current Biology 23(17), R709-711. Leonard, N.E., Shen, T., Nabet, B., Scardovi, L., Couzin, I.D. & Levin, S.A. (2012) Decision versus compromise for animal groups in motion. PNAS, 109(1), 227-232. Nabet, B., Leonard, N.E., Couzin, I.D. & Levin, S.A. (2009) Dynamics of decision-making in animal group motion. Journal of Nonlinear Science 19(4), 399-435. Deisboeck, T. & Couzin, I.D. (2009) Collective behavior in cancer cell populations. BioEssays 31(2), 190-197. Conradt, L., Roper, T.J., Couzin, I.D. & Krause, J. (2009) “Leading according to need” in self-organizing groups. The American Naturalist 173(3), 304-312. Dyer, J.R.G., Johansson, A., Helbing, D., Couzin, I.D. & Krause, J. 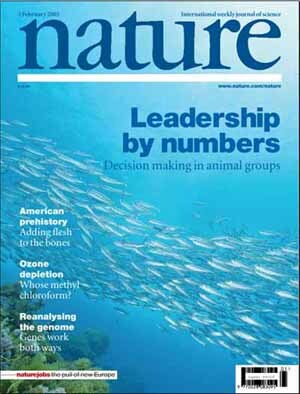 (2009) Leadership, consensus decision making and collective behaviour in human crowds. Philosophical Transactions of the Royal Society of London, Series B 364(1518) 781-78. Ward, A.J., Sumpter, D.J.T., Couzin, I.D., Hart, P.J.B. & Krause, J. 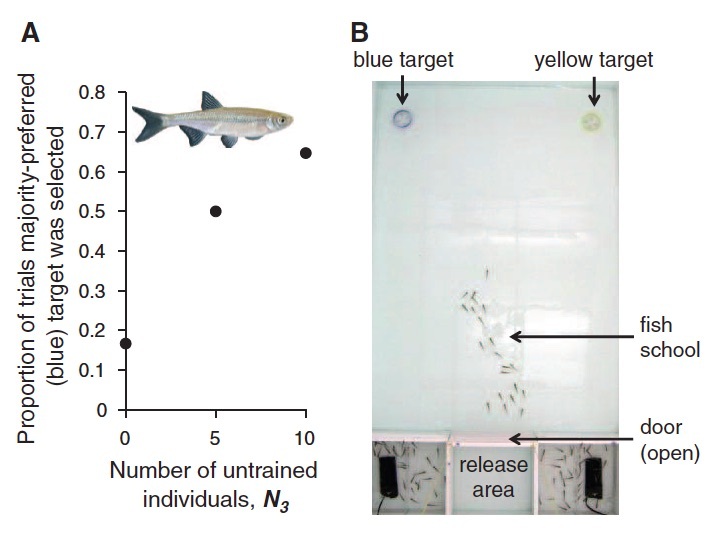 (2008) Quorum decision-making facilitates information transfer in fish shoals. PNAS 105(19), 6948-6953. Sumpter, D.J.T., Krause, J., James, R., Couzin, I.D. & Ward, A.J.W. (2008) Consensus decision-making by fish. Current Biology 18(22), 1773-1777. Dyer, J.R.G., Ioannou, C.C., Morrell, L.J., Croft, D.P., Couzin, I.D., Waters, D.A. & Krause, J (2008)Consensus decision-making in human crowds. Animal Behaviour 75, 461-470. Couzin, I.D. (2007) Collective minds. Nature 455, 715.